Windows add to the curb appeal of your house. With attractive windows that complement the house’s architectural style, your home will surely st andout in your neighborhood. Apart from increasing the aesthetic value of your home, windows provide you with the comfort you need for your activities. Whether you are reading a novel, trying out a recipe, or arranging your clothes, the natural light and refreshing air coming through your windows make you comfortable. Windows also help define the style of your house, whether it is vintage or contemporary. You can customize any window to match your varying tastes and requirements. When looking for windows, consider the part of the house where you are going to install them and the functions you need. These windows have two sashes in a single frame. The design allows you to slide the sash upward or downward for sufficient ventilation. Many people often put double-hung windows adjacent to decks, walkways, and patios for their decorative look and function. Aside from their ornate look, they are also perfect for the kitchen, as you can open them easily to remove smell and smoke from cooking. You can open them from the top or bottom. Bay and bow windows are perfect for your living area and bedroom. As they extend out from the exterior of your house, you are able to maximize your living spaces. You do not just get a stylish window but also a practical one, especially if you need more space in your room. Hinged on the left or right side, these windows open outward. They provide maximum passage of light and air. St. Charles MO casement windows are typically suitable for bathrooms and walk-in closets for the exceptional light and ventilation they provide. A picture window is a huge stationary window that lets in the maximum amount of light and provides an extensive view of the outdoors. It is ideal for high-ceiling spaces, and reflecting staircases. You can also use it for the different floors of your house. As these windows do not open, many people only use them for decorative purposes. Others install stationary windows simply to allow more light into the room. You can have these windows customized in any angle or shape. Often found in contemporary-style houses, stationary windows are used in a room together with operating types of windows, such as casement, single-, and double-hung windows. You often see them in bathrooms, home libraries, and walk-in closets. For your windows installation in St. Charles MO, trust only an industry leader. Renewal by Andersen® of St. Louis offers high quality Renewal by Andersen windows in popular types and well-loved styles. 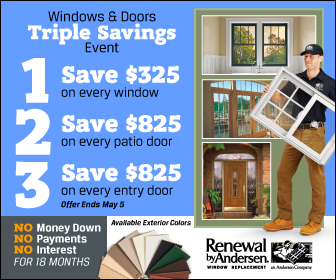 As a fully certified and recognized retailer, we feature an array of beautiful, and energy-efficient products that come with Renewal by Andersen’s exceptional 20/2/10 limited warranty. Contact us today to learn more about the different types of windows you can use for your home.